Supplies: White Card Blank 5" X 6 1/2" Halcraft, Papers: Generations Stackers, all others Stampin Up, Stamps: Scrappy Cat-Inspirations, Clearly Wordsworth-V026 Tiny Wise Words, Ink: Ranger Archival Ink: Jet Black, Stampin Up-Bermuda Bay, VersaMark Ink Pad, PaperCraft Inspirations-card maker's templates, Cuttlebug embossing folder-Swiss Dots, Stampin Up-Sizzix Embosslits Scalloped Heart of Hearts, EK Success-heart corner punch, Stampin Up-Modern Label punch, The Paper Studio Spare Parts-mini heart brads, sentiment inside generated in Printmaster 11(made up by me), glue dots, pop dots. Fabulous project! Love what you did with our puzzle challenge. Thanks for joining us at Tuesday Taggers - hope to see you next time too! Love your take on the TT challenge and thank you so much for joining in this week. This is lovely. Many thanks for joining in with this weeks oscc. Lovely card and a great take on the sketch. Thanks for joining in at Polkadoodles this week. 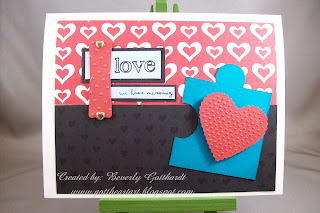 Great use of the sketch and I like the jigsaw! Thanks for entering the Polkadoodle Challenge - hope you can join us again next week! 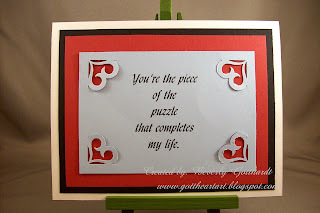 Thanks for joining us at Polka Doodles with such a lovely card. All the elements work really well together. Awww - such a sweet card, Beverly! Thanks so much for playing along with the colourQ this week - I always love visiting your blog & I hope your anniversary is an awesome one!!! BTW - I'm wishing you a happy anniversary now, since I'll forget by September - lol!